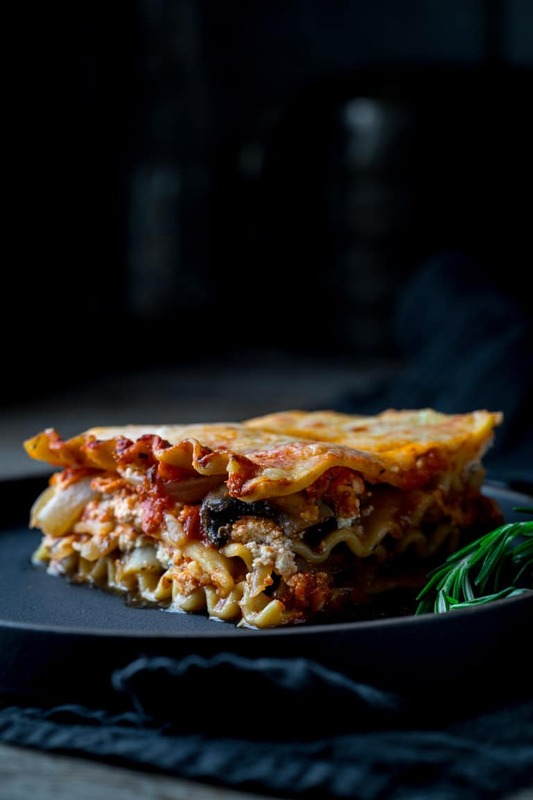 Today I am sharing a favorite new vegetarian meal: lasagna, made with caramelized onion and portabella mushrooms. It is so satisfying, even meat lovers will love this comfort-food classic. This vegetarian caramelized onion and portabella mushroom lasagna is made with part-skim ricotta and shredded cheese, and can be made two days ahead. DISCLOSURE: This post is sponsored by Hannaford. I was compensated for my time. All opinions expressed here are my own. 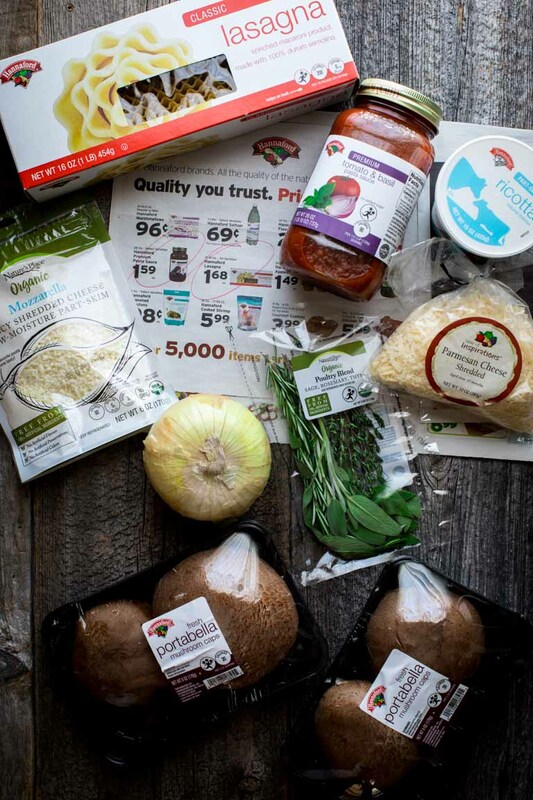 Thank you for supporting the brands that make Healthy Seasonal Recipes possible. When I was in culinary school, there was always a bit of buzz surrounding the mythological challenge of being presented with the ever-feared blind basket. To those of you who haven’t heard this term, you are surely aware of it, if not by that name. 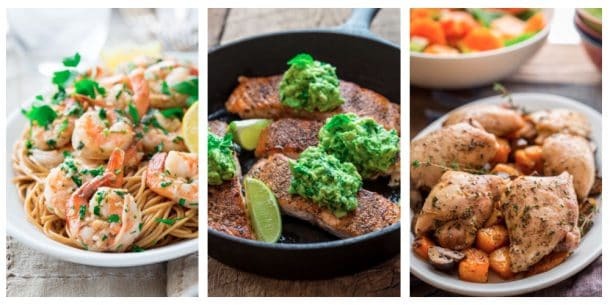 On shows like Chopped or Iron Chef, these are the ingredients that are presented to a chef as they are about to start cooking, and they need to make a split second decision of how to prepare them. They then cook with those ingredients under a time constraint. In school, it was always discussed by the students with reverence and fear. Certain chef instructors were known to spring a blind basket on the students. Most notorious of all was the second year fine dining class. I had heard stories! I spent my entire first year dreading having a blind basket thrown at me. The mere idea made my hands sweat. And the time never came. The closest we ever got to a blind basket was when one of our chef instructors agreed to let us give him a blind basket. I remember scurrying around the kitchen with my teammates collecting what we thought were challenging ingredients, but then watching with awe as Chef Bill made a spicy Thai inspired noodle dish piled with herbs and shrimp in coconut broth. I was reminded of the idea of the blind basket the other day when I was leafing through the Hannaford Weekly Flyer. What could I make with what I found in the pages? 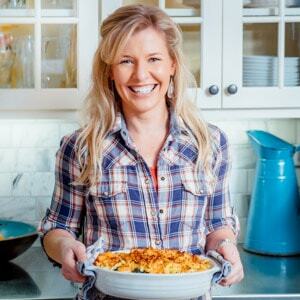 I saw that all the makings for a veggie lasagna were on deal that week — lasagna noodles, pasta sauce and cheese. If only all blind baskets were that easy, then I would’ve had nothing to worry about all those years ago. I have been meaning to make you all another lasagna- since the time I shared my beef and spinach lasagna. I decided to keep this one vegetarian, and to bulk it up with tons of veggies. 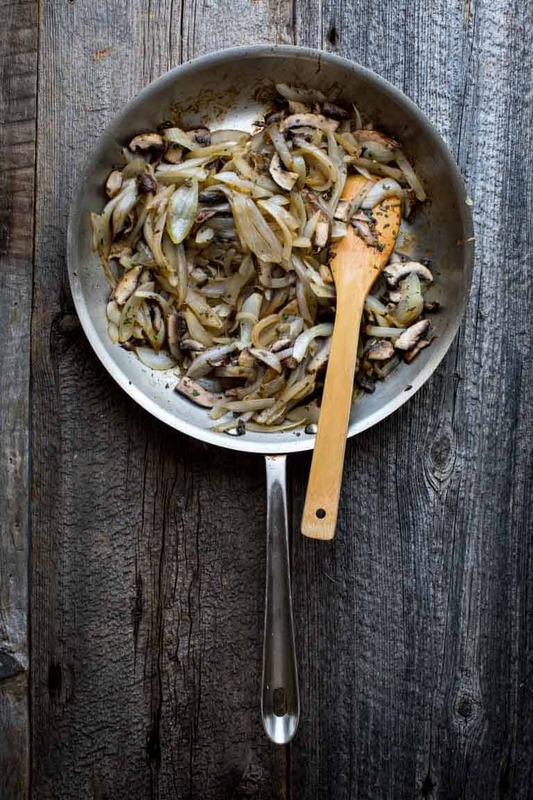 I sautéed sweet onions and portabella mushrooms until the onions were incredibly soft and caramelized. Then I added in chopped fresh herbs. I used the Nature’s Place “Poultry Blend” because I wanted to use a variety of herbs, but didn’t want to buy three separate packs. This pack has sage, rosemary and thyme in it. How convenient! Tip: Go easy on the rosemary; while delicious and a great match for mushrooms, rosemary is very bossy and can take over the flavors of the dish. I used more sage and thyme- and only about a total of 1 ½ teaspoons of rosemary in the overall blend. Even though the Nature’s Place herbs and the Hannaford mushrooms (and the Taste of Inspirations Parmesan Cheese for that matter) weren’t in the weekly flyer I knew that by just scanning My Hannaford Reward barcode on the Hannaford mobile app, I was going to earn 2% rewards on all store brands. How easy is that! All I have to do is bring up the mobile app as I check out, and they scan the screen. Everything is automatically tracked for me including My Reward Totals! I layered the veggie mixture right in between the Hannaford Pasta Sauce, Nature’s Place Part-skim ricotta, shredded cheese and lasagna noodles. I tested it with both the oven-ready lasagna noodles and with the traditional kind that you have to boil. Both worked easily, but I loved the convenience of no-boil noodles! Bonus: one less dish to wash! Check out more information about My Hannaford Rewards and the Weekly Flyer here. Pre-cook the veggies — You never want to add raw vegetables directly into the mushroom lasagna. Not only will the veggies release a lot of water and potentially make the vegetable lasagna soggy, but they also won’t cook through all the way in the oven. 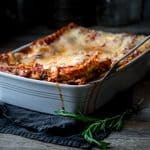 To make sure your lasagna is easy to slice and serve and is cooked all the way through, caramelize the onions and sauté the mushrooms before building your lasagna. Trust me, it’s worth the extra few minutes of prep work! 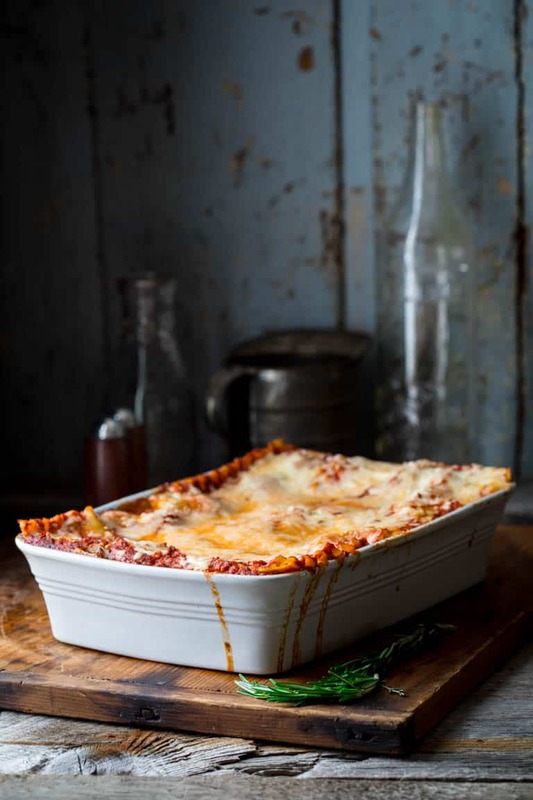 Spread pasta sauce on the bottom of the baking dish — To prevent the noodles from sticking to the baking dish, you should spread a thin layer of sauce along the bottom of the dish. You don’t need much, just half a cup or so. 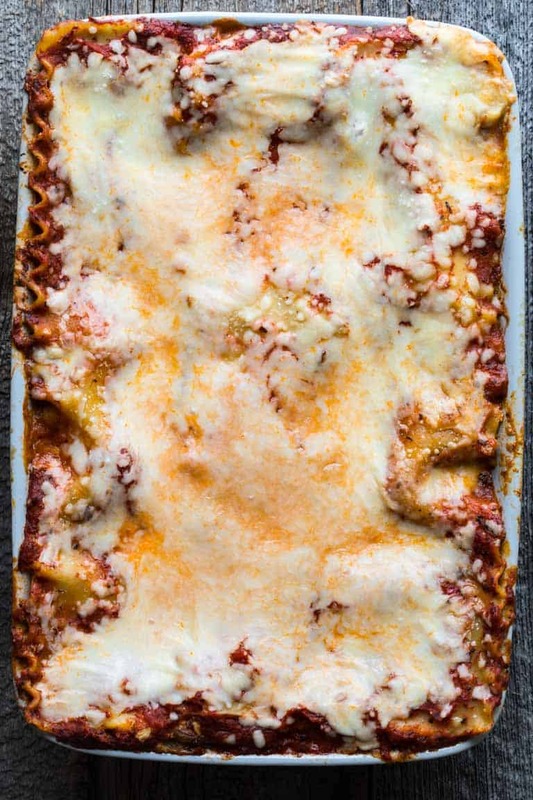 Don’t overfill the layers — I know it’s tempting to really load up every layer of the lasagna, but if you do that your lasagna will be far too heavy and impossible to serve. Remember: your lasagna has lots of layers, so a little ricotta and sauce in each layer will go a long way. 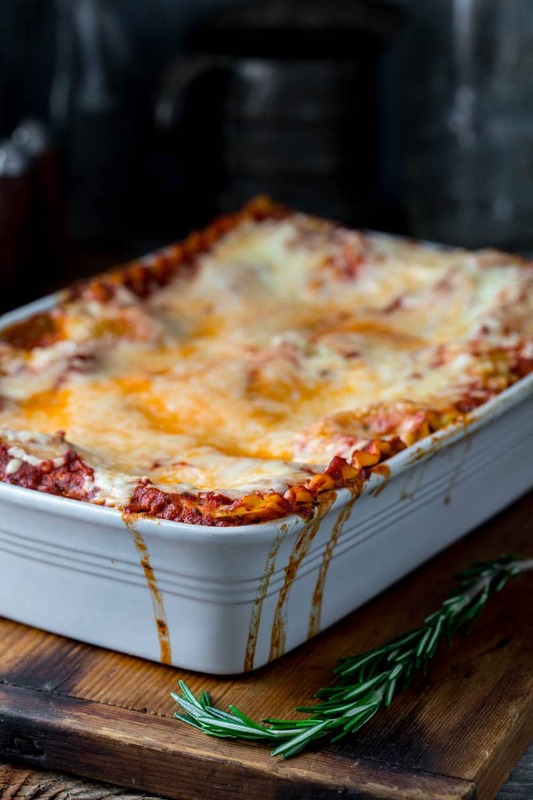 Bake with foil on top — Cook the lasagna most of the way with foil on top of the baking dish. This will ensure the lasagna heats through as fast as possible. Plus the foil will prevent the noodles from drying out and the top from browning in the oven too quickly. Near the end of the baking time, remove the foil and sprinkle on a little cheese and cook a little longer until the top is golden and bubbly. Vegetarian lasagna freezes surprisingly well and is super easy to reheat later on. To freeze lasagna, you first need to assemble and bake it as you normally would. Omit the cheese on top! Then, let it cool to room temperature you can freeze the entire lasagna whole. Just wrap it in two layers of plastic wrap. If you have an extra-large re-sealable bag, slide the lasagna into it. That will help prevent freezer burn. If you don’t have an extra-large freezer bag, wrap the lasagna in foil. 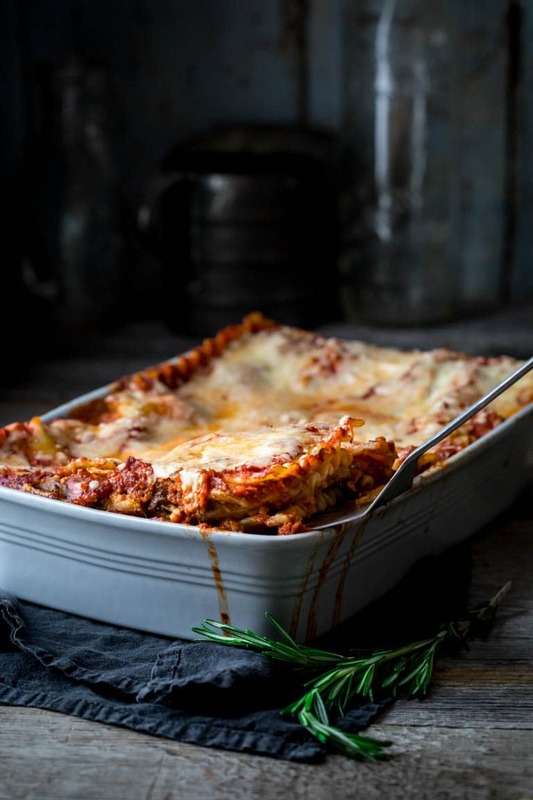 TO defrost the lasagna, set in the fridge and let defrost for two days before reheating, covered in the oven set at 325 degrees F. Once it is heated through, increase the heat to 35o, add the cheese on top and continue baking. 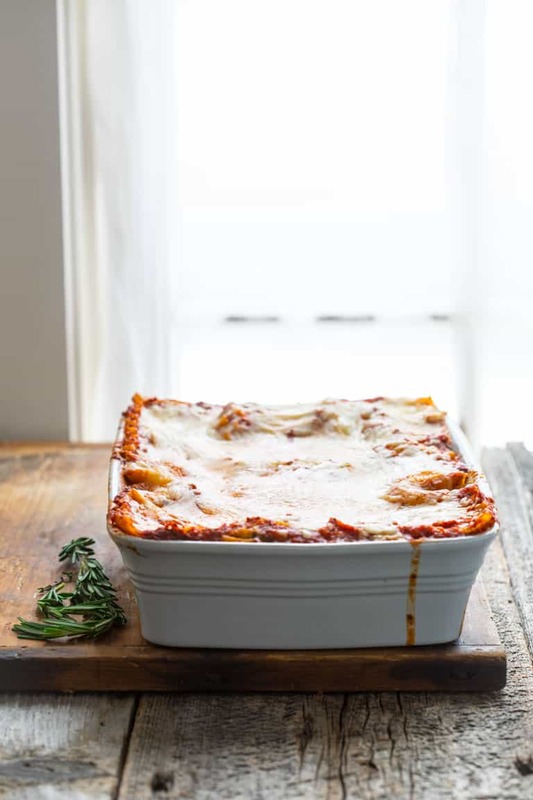 If you prefer to freeze individual servings, cut the cooked lasagna into slices and transfer them to re-sealable containers. Freeze up to 6 weeks. To reheat the lasagna slices, pop the frozen slices into a warm oven and cook until heated through. This will take more than a half hour since it is frozen through, so have patience. Check with an instant read thermometer to make sure it is over 145 degrees before serving. Have you heard the term Blind Basket before? Do you watch Chopped or Iron Chef? 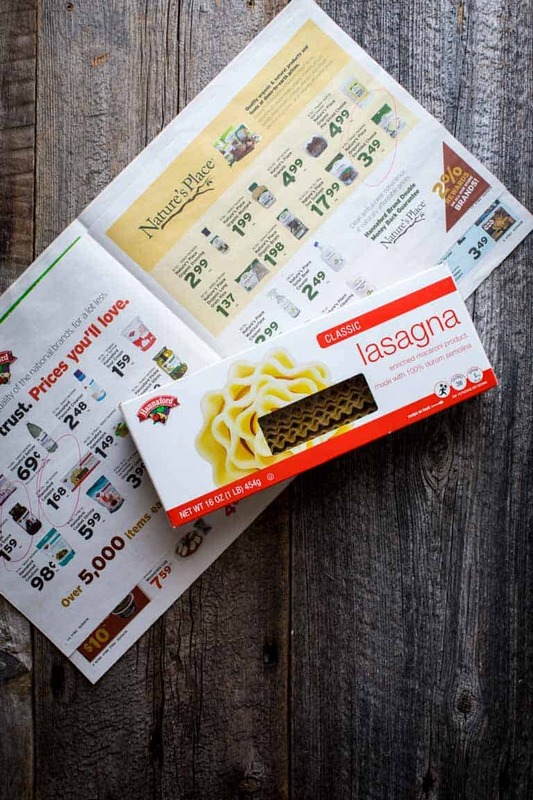 Do you plan your meals around the Weekly Flyer? This vegetarian caramelized onion and portabella mushroom lasagna is made with part-skim ricotta and shredded cheese, and can be made two days ahead. If using regular noodles, bring a large pot of lightly salted water to a boil. (Skip to step 2 if using oven ready noodles.) Cook lasagna, stirring occasionally according to package instructions or until al dente. Drain and rinse with cold water. Meanwhile, heat oil in a large skillet over medium heat. Add onion and salt and cook, stirring occasionally (add 4 to 5 tablespoons water as necessary to prevent from browning before the onions become very soft) until browned and very soft, about 15 minutes. Stir in mushrooms, herbs. Increase heat to medium-high and continue cooking, stirring often, until the mushrooms have become soft and their liquid has evaporated, 5 to 7 minutes. Spread ½ cup pasta sauce in the bottom of the prepared baking dish. Layer three cooked lasagna noodles vertically into the baking dish. Top with half of the onions and mushroom mixture. Spread with about half of the ricotta mixture. Top with ¾ cup sauce and 2/3 cup shredded mozzarella. Layer on 3 more noodles, the remaining onion mixture, the remaining ricotta mixture, 3/4 cup sauce and 2/3 cup cheese. Top with the remaining 3 noodles and the remaining ¾ cup sauce. Cover with aluminum foil. Bake until the lasagna is steaming hot all the way through, 38 to 45 minutes. Remove foil, sprinkle with the remaining 2/3 cup shredded mozzarella and Parmesan. Bake until the mozzarella on top is just melted but not browned, about 10 minutes. Let lasagna cool 10 to 15 minutes before slicing it into 8 servings. To Make Ahead: Can be prepared through step 5 up to 2 day in advance. Proceed with step 6 adding an extra 15 minutes of cook time before removing foil. 1. Never heard the term blind basket, but was aware of the meaning. 2. No, I don’t watch those shows. 3. Sometimes. I shop at different places. Your lasagna looks amazing. I can imaging the taste with the fabulous flavors of the onions and mushrooms! It really was making my mouth water reading and seeing your photos. Thank you Denise! Glad you think the lasagna looks good! Have a great weekend. No need to pre-cook them. Just cook covered as directed above, then remove the foil and top with cheese for the last bit of cooking. Let me know how you like it Sue! Happy Cooking! I basically do a blind basket challenge every night when I open up the fridge to decide what I have and what I can make… We’ve had some winners and losers — your lasagna is clearly in the ‘WIN’ column. That happens to me too more often than I’d like to admit! Lol! Thank you Lisa. It’s comfort food around here. Thank you so much. That’s so nice of you to say. The meaty texture from the portabellas will make sure no one missed meat in this lasagna that’s perfect for Meatless Monday. I totally agree, and it has plenty of protein without the meat too (22 g.) Glad you pointed that out Sharon. Have a great weekend. Drooling over this! I am dying for a nice big corner slice! Love lasagna and this looks amazing. I always go for the ones with the crustiest edge myself! Ha ha. Thanks so much Jessica, and I am glad you stopped by. I make mine with oyster mushrooms but I like your version as well. Will give it a try. I love that idea! Oyster mushrooms have great texture. So delicate! Well I guess, I am that way too in a way. Some weeknights I feel like I am having a blind basket when I look into the fridge. Amazingly we always end up with a meal. Lol. Thanks so much Albert. Have a great day. Thank you very much Christiann! Oh this looks beautiful! I’ve been wanting to make a vegetarian lasagne for ages but get put off by béchamel sauce and not loving heaps of sweet potato.. so I love the sound of the mushroom mix and mozzarella. I do love lasagna with behamel, but another dish to clean always seems like a drag. Thanks so much for saying so Claudia. I am glad you stopped over today. Have a great week. That is great to hear! Thank you so much for coming back to let us know! Have a great day. Do you like your purchased lasagna sheet? I find them to be too thick. If you have a good one, love to hear it! I used the Hannaford Classic Lasagna and I also tested with the Hannaford No-Boil Lasagna. I loved both. They are pretty standard in terms of their thickness, and a great value, so that’s what I am used to. Barilla makes a thinner lasagna noodle sheet, it is more square than long, so they line up the other way in the pan. I seriously need to find someone to share this with. My family wouldn’t even try this but I’d be in heaven!!! Now this lasagna is so calling my name! I made this for Lent last year and came back to grab the recipe again! SO good!!! !